Few places are as magical for Harry Potter fans as the Wizarding World of Harry Potter: Diagon Alley. The jaw-dropping detail of the park immerses you into a nearly perfect replica of the sets seen in the Harry Potter films. Here, dragons breathe real fire, goblins talk, and you can make things move with a swish and flick. The experience is enough to forget for a minute you’re a muggle. Seeing everything Diagon Alley has to offer, however, takes some planning. 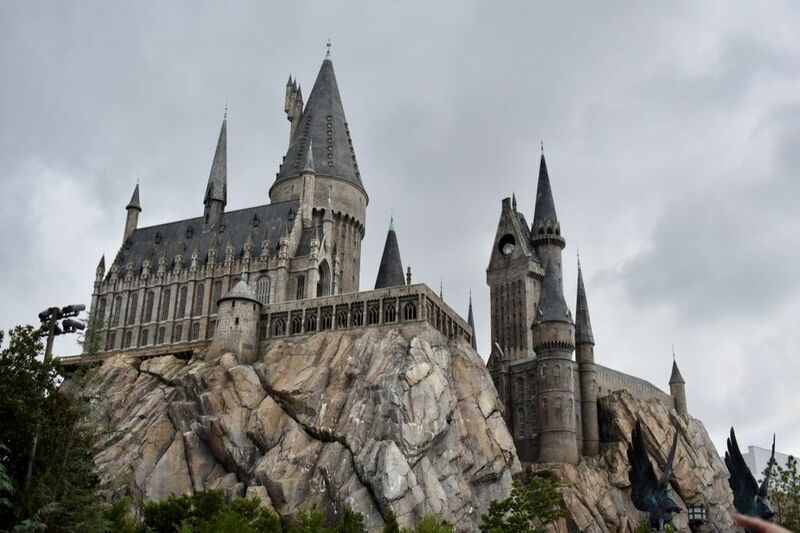 Here’s what you need to know before taking a trip to the Wizarding World in Orlando. Diagon Alley is one of the most popular spots in the entirety of Universal Studios Florida. So naturally, it is almost always packed. The best time of the year to go is in early December or late in January when the weather is cool, and there are fewer crowds. Other low-traffic times include September just after the school year has started and in May before school lets out. If you can’t visit during a slow time of year, the best way to dodge long lines and packed shops is to time your trip to Diagon Alley to avoid peak traffic times. The area gets more and more crowded as the day goes on but then empties out again closer to closing time. Try to get to Diagon Alley as soon as the park opens, leave in the middle of the day to relax or visit other parts of Universal Studios Florida, and then return in the late afternoon to see the rest. Pro tip: A perk of staying at some of the Universal Orlando Resort properties is early admission. Guests staying at the hotel can enter the park a full hour earlier than those staying off-site. Diagon Alley is located in the very back of the Universal Studios Orlando theme park. The entrance to the area isn’t marked, but you’ll know you’re close when it looks like you’ve arrived in London. There’s a big sign announcing King’s Cross Station, and a red British phone box sits just outside. There are three entrances to Diagon Alley, the most popular being the one lined with red brick, similar to those seen in the Harry Potter films. The other two entrances are similarly nondescript and located just to the right of the main brick entrance near Grimmauld Place. One Park: This ticket only buys you admission into Universal Studios. It’s fine if you just want to see Diagon Alley, but you won’t be able to ride the Hogwarts Express or visit Hogsmeade. Park-to-Park: A Park-to-Park pass allows you to enter both Universal Studios and Islands of Adventure on the same day and ride the Hogwarts Express. Note: Unless you buy a multi-day ticket, the pass you buy is only good for one day. Universal also offers an Express Pass that lets you skip the regular line (and longer wait times) for the Harry Potter and the Escape from Gringotts and Hogwarts Express rides. While the rides are an exciting part of visiting the Wizarding World of Harry Potter, they aren’t the only thing to do there. These are some of the biggest attractions found in Diagon Alley. It’s tough to say what is more impressive about this attraction: the ride or the wait. Like the Harry Potter and the Forbidden Journey ride in Hogwarts castle, making your way to the main event means passing through a series of jaw-dropping rooms that make you feel like you really stepped into a magical world — complete with life-like goblins and moving photographs. When you do finally get to the ride, it’s not for the faint of heart. The indoor roller coaster uses a combination of 360-degree motion and 3D screens to make you feel like you’re fleeing dark wizards as you escape the bank’s vaults. Needless to say, this ride is popular. Even on low-traffic days at the park, wait times can be upwards of an hour or more. Pro tip: Avoid the crowds by visiting during the offseason and rushing to the ride as soon as the park opens or just before close. If you have your heart set on getting a wand while visiting the Wizarding World (and why wouldn’t you? ), Ollivanders is the place to get one. Part show, part shop, the experience starts by watching a master wandmaker help one witch or wizard from each showing be chosen by their wand. When it’s over, you’ll get the chance to buy your own, including interactive wands that can be used throughout both Diagon Alley and Hogsmeade. Pro tip: While kids are often the ones picked to participate in the show, adults are sometimes given a chance — especially if they are particularly enthusiastic. Casting “spells” is easily one of the most fun things to do in Diagon Alley. Wave an interactive wand at one of the spell locations located throughout the park, and you can make umbrellas rain, suits of armor fall apart or shrunken heads sing. Locations are marked on a map that comes with your wand, as well as with bronze medallion at each site. Some of the spell motions can be a bit tricky, but park employers in full witch or wizard garb are usually on-hand to help out. Wands can be bought at a few different locations in Diagon Alley and Hogsmeade in dozens of styles, and you can choose a favorite character’s wand or find an “unclaimed” wand you like better. They aren’t exactly cheap (around $50 each), but they can be reused every time you return to the park. If at any point in the future the wand stops working, wandmakers at Ollivanders will repair it for you at no cost. Pro tip: If you’d rather not see the show or battle the crowd’s at Ollivanders, Wands by Gregorovitch — just across from Weasleys' Wizard Wheezes — usually has shorter lines. Exchange muggle money (U.S. currency only) for Gringotts bank notes at the money exchange. The notes can be used to buy anything for sale in Diagon Alley or Hogsmeade. If you don’t use it all, you can exchange it back at the guest services office at either park. While the wizard money is a fun touch, the real attraction here is the goblin. Ask the curmudgeonly creature questions, and he’ll respond. The various shops can be a great place to buy Potter-themed gifts or wares but are on the small side and can get crowded, especially during the summer when the Orlando heat drives everyone inside. Pro tip: If you try on anything at Madam Malkin’s Robes for All Occasions, be sure to stop in front of the mirror. It talks! The shows at Diagon Alley are different than the ones you’ll see in Hogsmeade. Instead of singing toads and Beauxbatons, shows here feature the puppeted Tales of Beedle the Bard and the “dulcet tones” of Celestina Warbeck. Outside the Diagon Alley entrance near Universal’s replica of Leicester Square, you’ll also find the Knight Bus. You won’t get to step inside the towering, purple, triple-decker bus, but a driver and loquacious talking head entertain passersby with friendly banter. You can take a train to Hogwarts (literally!) by riding the Hogwarts Express ride in King’s Cross Station. The entrance to the station is located just outside the entrance to Diagon Alley (past the Leaky Cauldron and red telephone box — you can’t miss it). Like the other rides at the Wizarding World of Harry Potter, the queue is part of the fun. Be sure to watch the line ahead of you to see others vanish through the wall at Platform 9¾. It’s a cool trick that’s easy to miss in the rush to get to the train. Once on the train, you’ll be ushered into a compartment and treated to a true-to-cannon storyline and digital scenery as you make your way to Hogsmeade over at Universal’s Islands of Adventure park. The story is different coming back to Diagon Alley, so be sure to take the train in both directions to see both. Pro tip: Because the train takes you between the two theme parks, you’ll need a Park-to-Park admission ticket to ride. Eternelle’s Elixir of Refreshment: If you’ve ever wanted to be a potions master, this kiosk can help. It sells bottled Gillywater and “elixirs” that can be combined (like magic!) to make a colorful, fruity beverage. Florean Fortescue’s Ice-Cream Parlour: This ice cream shop is straight out of Harry Potter and the Prisoner of Azkaban. In addition to the standard flavors you’d find anywhere, they also serve on-brand treats like Butterbeer soft serve and Pumpkin Juice. Leaky Cauldron: In the books and movies, the Leaky Cauldron was London’s gateway to the Wizarding World and a common resting place for Harry and his friends on the way to and from Hogwarts. Here, it’s a sit-down restaurant serving all kinds of British fare and adult beverages. The Fountain of Fair Fortune: Located next door to Florean Fortescue’s, the Fountain of Fair Fortune is where adults can go to grab a Butterbeer or more traditional alcoholic brews without braving the lines at the Leaky Cauldron. The Hopping Pot: Another beverage spot, this walk-up counter serves all the park's branded drinks, including the Wizard's Brew and Dragon Scale beers.